This is a reproduction of a book published before 1923. This book may have occasional imperfections such as missing or blurred pages, poor pictures, errant marks, etc. that were either part of the original artifact, or were introduced by the scanning process. We believe this work is culturally important, and despite the imperfections, have elected to bring it back into print as part of our continuing commitment to the preservation of printed works worldwide. We appreciate your understanding of the imperfections in the preservation process, and hope you enjoy this valuable book. ++++ The below data was compiled from various identification fields in the bibliographic record of this title. 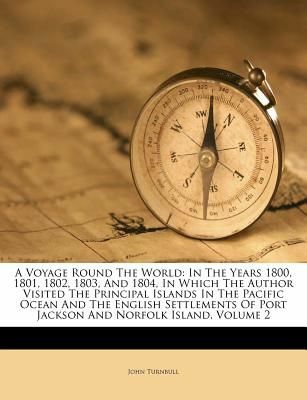 This data is provided as an additional tool in helping to ensure edition identification: ++++ A Voyage Round The World: In The Years 1800, 1801, 1802, 1803, And 1804, In Which The Author Visited The Principal Islands In The Pacific Ocean And The English Settlements Of Port Jackson And Norfolk Island, Volume 2; A Voyage Round The World: In The Years 1800, 1801, 1802, 1803, And 1804, In Which The Author Visited The Principal Islands In The Pacific Ocean And The English Settlements Of Port Jackson And Norfolk Island; John Turnbull John Turnbull Printed for R. Phillips by T. Gillet, 1805 Literary Criticism; American; General; Literary Criticism / American / General; Travel / Essays & Travelogues; Voyages around the world.